According to a survey published in Prensa Libre, 51% of Guatemalans are in favor of mining and 49% against. 51% favor mostly belongs to the metropolitan area and the rest of the country is against rural areas. First, pollute the environment? Perhaps the mining companies do not study environmental mitigation to prevent contamination? Which human activity pollutes not even a little the environment? There are strict laws and regulations that must be met for it. Or do not use technology to make all pollutants for the extraction of gold and silver do not pollute? Let us see what he has to do in order to operate a business, not just extract the gold but protect the environment. Consider the process and hard work it takes to get gold. To obtain approval for an activity of exploitation by the Government through the Ministry of Energy and Mines and the Ministry of Environment in Guatemala, you need to make a extensive environmental impact study. This includes the study of the flora and fauna of the area where it will explode, the study of watersheds and rivers, lakes, ponds, wells .. fragile geographical features such as hills, mountains, streams, the study of the social impact in the community such as the type of people who live in the area, population density, nearby community centers such as schools, churches, shopping centers if any, amount of people passing through the place, roads and trails available … well, a study covering social, biological, ecological, physical, geological, historical, human … well, covering various sciences focused on a community or area. In addition, an analysis of the negative effects that could influence each of these branches and provide effective solutions to prevent damage and how and what to use for that, with timelines and accurate implementation of preventive activities depending on the process that is taking the mine at the time. After approval of the Environmental Impact Study, the company will then begin their work and therefore has qualified people as engineering geologists, chemical, environmental, mechanical, technical expertise in the operation of machinery used, operators, security and many other workers who depend on the mining operation for at least 25 years which is the period of life of the mine. For work in open pit mines, summarize how they work. • Reservoir storage solutions. Plant for metal recovery. To start open pit mining cut all the trees and topsoil scraped leaving outdoor rock containing gold. Leading the rock using dynamite or heavy machinery. The gold is on the rock particles so small you can not see with the naked eye. To extract the gold in these tiny particles perform the following operations. Load the m aterial in huge vehicles and transported to the grinding section. In this section they reduce the size of large pieces of rock in a crusher. tubs, with geo waterproof membranes. These geomembranes are made from a non toxic material and protect in 2 ways, the material extracted by separating them from the soil and protect the soils from the chemicals. Theyn are useful to cover the dust after crushed from the rocks and make like a sandwich, where the geomembrana is the bread below and above the dust already crushed, forming clusters. The crushed material clusters vary in size from small to some 6000 tons of ore to large clusters with 600 thousand tons. The leach pads according to the volume of clusters, can range in size from half to 20 acres. Generally, the leach pads have three linings or coatings, synthetic materials and / or natural to prevent leaks, which pollute the waters with cyanide. For a small cluster of 50 meters in diameter and 5 meters high, drinking cyanide solution in the sprinkler system is about 200 gallons per minute. The cyanide content of the solution is 0.14 to 2.35 kg of cyanide per ton of water. Leaching cycles last from a few days to a few months depending on the size of the cluster and the quality of the ore.
For several days or months, depending on the size of the cluster, they spray water evenly cyanide, usually through drip irrigation. The water soaks lumps cyanide, cyanide dissolves gold microscopic particles while filtering for the cluster, and broth, or leached, runs the floor. On the geomembrana with a certain gap, run the gold cyanide solution by gravity to the pipes that lead to pools, reservoirs or ponds of precipitation. When mineral wealth without gold, after it has been leached by the cyanide solution, is sprayed clean water to wash the residual cyanide, and sent to the scrap yard or craters. The resulting wash water is filtered, and its concentration was adjusted to recirculate in the cyanide process. The cyanide solution containing the dissolved gold, flows by gravity or is pumped by pipeline to a storage reservoir. Where with pipes or ditches with linings, it leads to the metal recovery plant. The methods used for the recovery of the gold contained in the cyanide solution are zinc precipitation and activated carbon adsorption. In the zinc precipitation process adds zinc powder and lead salts to the gold solution. Gold is separated from the solution and precipitated in powder form, while the zinc dissolves into the solution when combined with cyanide. The gold dust is melted and cast into lingots or bars. The end products of this process are the gold bars, sterile cyanide solution, ie without gold, which is pumped to a storage reservoir, and a waste material, rocks without gold, but contaminated with cyanide. 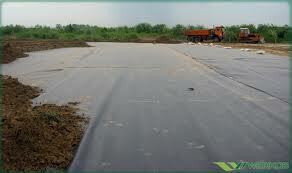 This material is discharged into conditioned sites to prevent contamination of soil and water. In the heap-leaching operations are stored four types of cyanide solutions in reservoirs lined to prevent leakage of solutions: The fresh leaching solution. The gold solution. The sterile solution. And the solution set to recirculate. Some operations of cyanide leaching extraction can be performed in open or closed systems, ie with open or sealed surfaces to the atmosphere. For example, the initial preparation and cleaning solutions and concentration adjustment for recirculation or discharge to the environment, of solutions used. When using pools, ponds or reservoirs for treating solutions. When the treatments of the solutions or tanks are hermetically sealed to the atmosphere in a “closed” system is reused or recycled sterile solution, to minimize the consumption of cyanide. When the environment to download a portion of these solutions, one proceeds as in the case of open systems.